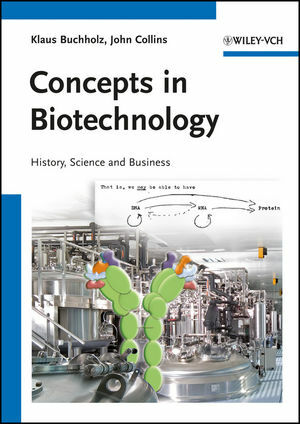 Adopting a unique approach, this novel textbook integrates science and business for an inside view on the biotech industry. Peering behind the scenes, it provides a thorough analysis of the foundations of the present day industry for students and professionals alike: its history, its tools and processes, its markets and products. The authors, themselves close witnesses of the emergence of modern biotechnology from its very beginnings in the 1980s, clearly separate facts from fiction, looking behind the exaggerated claims made by start-up companies trying to attract investors. Essential reading for every student and junior researcher looking for a career in the biotech sector. well-known textbook on biocatalysts and an advisory board member of several journals. Born in 1945, John Collins studied Microbiology (B.Sc.) at University College, London University, and a doctorate (Ph.D.; 1971) at the University of Leicester, UK. Postdoctoral work was carried out at UCSD, La Jolla 1971-4 with Don Helinski at the time DNA cloning was developed in collaboration with the Cohen and Boyer labs. of Hepatitis C virus using combinatorial biology as well as trying to explain the impact of scientific developments to the informed public. 2. The Early Period to 1850. 3. The Period from 1850 to 1890. 3.3 Practical Application, Technical Progress and Institutional Development. 4. The Period from 1890 to 1950. 4.2 Research – Advances in the Basics of Biotechnology: Experimental Findings. 4.3 Technological Development, Progress and Application. 5. Outlook, from 1950 Onwards: Biotechnology – Science or What? 5.2 Traditional Biotechnology and the Decehma Report. 5.3 The Changing Focus in BT in the USA in the Early 1980s. Part Two The New Paradigm Based on Molecular Biology and Genetics. 6. Broadening of Biotechnology through Understanding Life, Genetics and Evolution. 7. The Beginning of the New Biotechnology. 7.2 The Beginnings of Evolution Theory and Genetics. 7.3 The Origin of Recombinant DNA Technology. 7.4 Oligonucleotide Synthesis Leads to Protein Engineering. 7.5 Synthetic DNA, Reverse Transciptase: Isolating Genes. 7.6 Biodiversity and Gene Mining. 7.7 Creating New Diversity by Design or Empirically. 7.9 Inheritable Predisposition to Disease. 8. Ethical Aspects Related to Genome Research, and Reproductive Medicine. 8.1 Negative Public Reaction to Gene Technology. 8.2 Ethical Aspects: Animal Cloning and Fertility Research. 9. Elucidating Protein Structure: The Beginnings of Rational Protein Design. 9.1 Cambridge England, the Cradle of Structural Analysis of Macromolecules. 9.2 Redesigning the Protein Core. 9.3 Redesigning the Protein by Altering Primary Sequence. 9.6 Validation of Drug Design Based on the known Structure of the Target. 9.7 General Considerations in Drug Development. 10. The Development of Antibodies as Pharmaceutical Products. 10.1 An Introduction to the Immune System. 10.2 The Beginnings of Applied Immunology. 10.4 Producing Antibodies via rDNA and Combinatorial Biology. 10.5 Affinity Enrichment on Surface of Immobilized Target Molecules. 10.6 Mice with Human Antibody Gene Repertoires. 10.7 Two Severe Setbacks during Clinical Testing. 10.8 A Survey of Therapeutic Antibodies. 11. Hereditary Disease and Human Genome Analysis. 11.2 Heredity Studies and Family Counselling . 11.3 Early Attempts to Analyse the Human Genome. 11.4 The Personalized Genome and Personal Medicine. 11.5 Analysing the Effect of the Environment on the Human Genome: Epigenetics. 12. Transgenic Animals and Plants. 12.2 Stem Cells and Gene Targeting. 13. Extrapolating to the Future. 13.1 Summary of the Status Quo. 13.2 Insect Control Through ‘Sterile’ Males (SIT). 13.3 The Future of Gene Therapy. 13.5 Flash Sequencing DNA: A Human Genome Sequence in Minutes? 13.6 Systems Biology and Looking for ‘Druggable’ Targets. 14. Biotechnology and Intellectual Property. 14.2 Patents Ensure Growth and Rapid Dissemination of Knowledge. 14.3 Owning a Patent does not simply Mean that it can be Implemented: “Freedom to Operate’ (FTO). 14.4 Life-forms as ‘Novel Subject Matter’ for Patents? 14.5 Technology “State of the Art’: Precedence/Directives, not Fixed by Law. 14.6 Who can make Decisions about Public Morality? 14.7 Biotechnology-oriented Directives Guide Patenting Decisions. 15.2 Aspects of Applied Microbiology. 15.5 Process Sustainability and Ecological Considerations. 15.6 Biosystems Engineering, including Omics Technologies. 16.5 Food Processing and Products. 16.7 Summary, Trends and Perspectives. 17.2 Drug Targeting, Discovery Strategies and Development. 17.4 Products, Pharmaceuticals Made by Biotechnology. 17.6 Business: Companies and Economic Aspects. 18.2 Political, Ethical and Biosafety Aspects. 18.4 Application of Modified Plants and Products.